This calculator will analysis the rigid rectangular spread footings with up to 8 total piers, and for either uniaxial or biaxial resultant eccentricities. 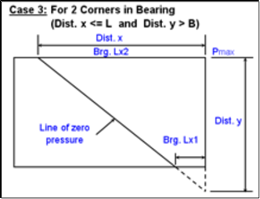 Overturning sliding, and uplift stability checks are made when applicable, and resulting gross soil bearing pressures at the four (4) corners of the footing are calculated. The maximum net soil bearing pressure is also determined. A specified permissible value for the factor of safety against overturning. However, a minimum value of 1.5 to 2.0 is suggested, based upon the particular conditions. Footing Length, L = ft.
Footing Width, B = ft.
Footing Thickness, T = ft. Soil Depth, D = ft. The 'Xp' coordinate is the x-distance from the origin Y-axis to centroid of a particular pier/loading. of the footing base plan. The 'Yp' coordinate is the y-distance from the origin X-axis to centroid of a particular pier/loading. The x-direction dimension, 'Lpx', of the particular pier. The y-direction dimension, 'Lpy', of the particular pier. The pier height, 'h', is also the distance from the point of application of any horizontal loads (Hx, Hy) to the top of the footing. The pier height, 'h', should always be a positive number, but it may be input = 0. The pier height, 'h', is used in conjunction with the horizontal loads to obtain any additional moments (Mx, My) that are to be eventually summed with the applied moments. 'Pz' is the vertical (Z-axis) load to be applied at the pier location. 'Hx' is the horizontal (X-axis) load to be applied at the pier location. 'Hy' is the horizontal (Y-axis) load to be applied at the pier location. 'Mx' is the X-axis moment to be applied at the pier location. 'My' is the Y-axis moment to be applied at the pier location. 'S Pz' is the summation of all applied vertical loads at pier(s) plus footing weight, soil weight, and surcharge weight. The value, 'ex', is the eccenticity (location) of the resultant of all the weights and applied loads measured from the Y-axis of the footing. The value, 'ey', is the eccenticity (location) of the resultant of all the weights and applied loads measured from the X-axis of the footing. 'S Mrx' is the summation of the (righting) moments resisting overturning about the X-axis of the footing. Note: the applied live loads and the surcharge weight are not included. 'S Mox' is the summation of the moments causing overturning about the X-axis of the footing. 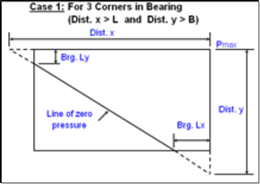 This program considers applied moments and horizontal loads as forces causing overturning. However, an uplift load is considered as a force causing overturning only when there is an applicable resultant eccentricity in the direction of overturning. For an uplift pier load, the "excess" pier weight (pier weight less soil weight) is subtracted from the uplift load at the pier location. 'S Mry' is the summation of the (righting) moments resisting overturning about the Y-axis of the footing. 'S Moy' is the summation of the moments causing overturning about the Y-axis of the footing. 'Pass(x)' is the passive soil pressure against the footing base of width, 'B', which is available to resist X-direction horizontal loads. Note: passive pressure against piers is ignored. 'Frict(x)' is the frictional resistance between the footing base (concrete) and the soil available to resist X-direction horizontal loads. 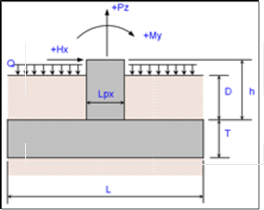 'Pass(y)' is the passive soil pressure against the footing base of length, 'L', which is availble to resist Y-direction horizontal loads. 'Frict(y)' is the frictional resistance between the footing base (concrete) and the soil available to resist Y-direction horizontal loads. 'S Pz(down)' is the summation of all applied vertical dead loads acting downward at pier(s) plus footing weight and soil weight. Note: the applied vertical live loads and the surcharge weight are not included. 'S Pz(uplift)' is the summation of all applied vertical loads acting upward (uplift) at pier(s). 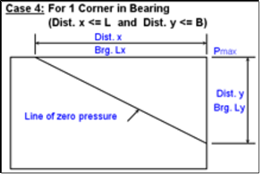 For cases of biaxial resultant eccentricity with 1 to 3 corners without bearing (when ABS(6*ex/L)+ABS(6*ey/B) > 1.0), the Distance 'x', is the distance away from the corner of maximum soil bearing pressure to the "line of zero pressure", running in the X-axis direction along the edge of the footing. Distance 'x' has no sign convention associated to it. 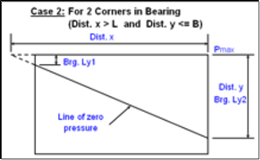 For cases of biaxial resultant eccentricity with 1 to 3 corners without bearing (when ABS(6*ex/L)+ABS(6*ey/B) > 1.0), the Distance 'y', is the distance away from the corner of maximum soil bearing pressure to the "line of zero pressure", running in the Y-axis direction along the edge of the footing. Distance 'y' has no sign convention associated to it. 'P1' is the gross soil bearing at footing corner #1, which is located at the lower right-hand corner of footing plan. 'P2' is the gross soil bearing at footing corner #2, which is located at the upper right-hand corner of footing plan. 'P3' is the gross soil bearing at footing corner #3, which is located at the upper left-hand corner of footing plan. 'P4' is the gross soil bearing at footing corner #4, which is located at the lower left-hand corner of footing plan.